Week 6 Two sections of decking. 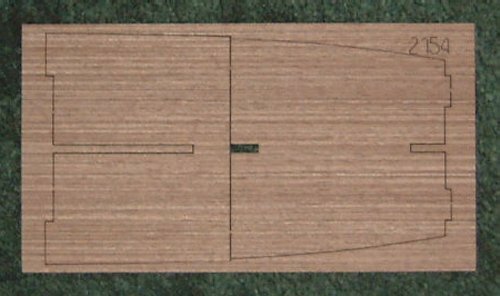 Well, as I'm not putting frames on till the keel is complete, and I haven't decided whether the deck will go on before or after the hull planking, I couldn't do any thing this week. When it comes to modelling, patience is a virtue. This instructions suggest varnishing the decks before you fit them. I would advise against this as it will make them warp. It's not difficult to varnish them in place anyway. There is also mention of using pins to hold the decking in place. This wood looks as if it will make a stunning deck once varnished, but is also very easy to split. I would drill a small hole in it before nailing to try and stop it splitting. Experiment with some of the off-cuts before working on the deck. I think that masking tape would be a better solution for holding it - it holds quite well, but comes off cleanly. Don't pull it too tight or you may distort the deck. Next week we should get another section of keel and another frame.